On this day in history, 10th March 1524, thirty-two-year-old King Henry VIII suffered a jousting accident. The king had forgotten to lower the visor of his headpiece and was struck by his good friend and brother-in-law, Charles Brandon, Duke of Suffolk, on the brow. It could have been a very serious accident “for the Duke’s spear broke all to splinters and pushed the King’s visor or barbet so far back by the counter blow that all the King’s headpiece was full of splinters”. A Frenchman was killed in a joust against his brother at the Field of Cloth of Gold in 1520, Courtier Sir Francis Bryan lost an eye in the Shrovetide joust of 1526, and Henry II of France died in 1559 a few days after his opponent’s lance struck his helmet and a long splinter pierced his eye and penetrated his brain. 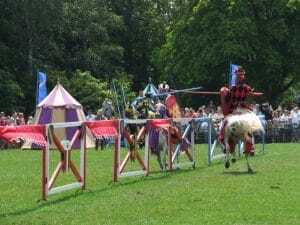 People have even been killed re-enacting jousting; in 2007 a professional jousting re-enactor was killed after a splinter sheared off a 7ft wooden lance and went through his eye and brain while filming an episode of Time Team. Henry VIII was lucky to survive the accident. Henry VIII also suffered a jousting accident in January 1536 – click here to read more about that. Picture: Jousting at Leeds Castle © Copyright Peter Lelliott and licensed for reuse under this Creative Commons Licence, Geograph.org.uk. Jousting, even with more safety today is still dangerous and a few years ago there was a newspaper article about a young man who was killed, but this was how he would have wanted it. his friends said as he loved the sport. Nobody loved jousting more than these too… but this was a wake up call for Henry. He still jousted though, even though he could have been blinded or killed. I think Henry VIII idolised Henry V and jousting was a substitute for war as far as showing off your power and masculinity was concerned. He needed to show his people that he was a strong man and king. Yes, definitely Claire, you had to show yourself as strong and physically able or your manhood was questioned. Nobles and their sons all had knights and weapons training. Henry V was his superhero. You are also learning skills for war in the tourney and tournament. Herny’s dad allowed him to learn the skills but not take part. The moment he was King he was off. This was definitely a way to play at war and show you are a strong warrior King. Henry never quite lived up to Henry V in war, but then Henry V had more of a base in France to get supplies from. Jousting is very exciting as well, a real adrenaline rush. Poor Suffolk, though….must have felt awful despite the King’s reassurance. Jousting was in a sense dicing with death, something that our royals are not allowed to do today, even in the Falklands war Prince Andrew was not in the thick of it regardless of what the press said at the time, I know it was a different age and princes and kings did take part in very dangerous sports such as jousting, it was a way to show of their prowess and Henry loved it, being very athletic and of an assertive nature, yet it was also foolhardy of them for had Henry died the country would suddenly have been thrown into crisis, Henry V111 did worship his namesake it’s true and it’s easy to see why, Henry V is immortalised in our history for beating the French whose army was twice the size of the English yet by his very skill as a tactician and outstanding courage he led his army to victory against all odds, Shakespeare wrote a play about him and in our age Hollywood has made several films about this outstanding King of ours whose name made the French quake in fear, it’s easy to see why Henry idolised him, I think he wanted to be remembered as another by his military prowess and bravery also but instead he is remembered for his marital adventures, something which he didn’t quite have in mind at the start of his reign. July 2016 – The Guardian – English Heritage is ‘deadly serious’ about bid to get jousting into Olympics, reads the headline. I consider the use of horses for this so-called sport a form of animal cruelty, and do hope the bid is turned down. i don’t believe this should happen either, some beautiful horses die at Aintree and the Grand National, therefore I hope they knock this idea on the head. Takes a lance to the face LIKE A BOSS! Wow. Gail, why do you consider this animal cruelty? I can’t see them getting the funding. For one thing, its also an expensive sport. Cycling gets the biggest share of the pot now, but has an undeserved tarnished reputation due to three incidents out of thousands over several years. Jousting is exciting…I have seen live jousting. You have to train and the horses are specifically trained and protected also. It’s not animal cruelty. Everything is done to protect rider and horse alike and, despite a few headlines which highlighted some recent tragedies. Dozens of jousts occur every year without any harm to riders or horses. It’s also unfair and no longer accurate to call the National at Aintree cruel. In fact fewer horses are hurt in the National than any other race. It has been made safer every year, perhaps too safe. The horses are now forced to jump through the hedge not over it, causing a pile up and slips. However, numerous other races are far worse. These horses are highly trained and have the best medical care. The same is true of most jousting events. Calling it animal cruelty is probably a lack of knowledge of the reality behind this sport. I do not believe in using animals for entertainment. Period.